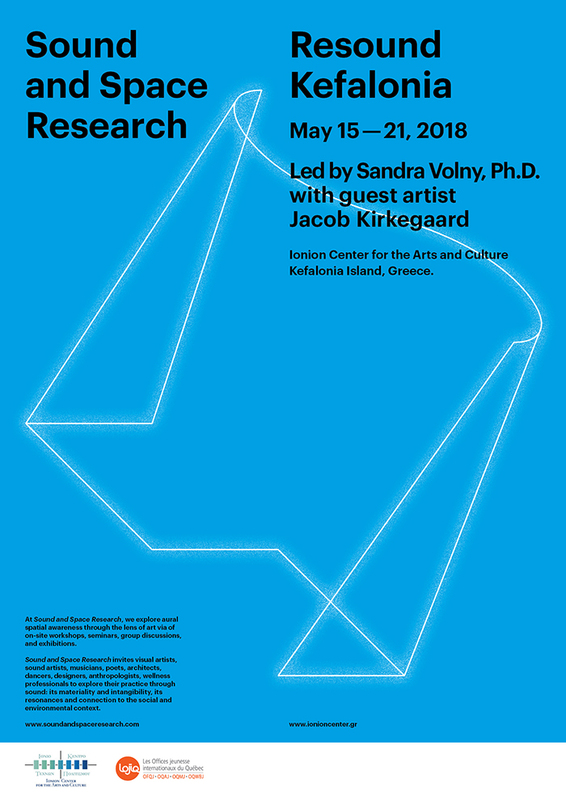 Organized and curated by artist and educator Sandra Volny PhD, Resound Kefalonia is an intensive Sound and Space Research week hosted at the Ionion Centre for the Arts and Culture in Kefalonia Island in Greece, from May 15 - May 21, 2018. Invited guest danish sound artist Jacob Kirkegaard will act as a mentor, presenting his work and leading a site specific workshop with the participants. Participants are invited to explore their art practice through sound: its materiality and intangibility, resonances and connection to the social and environmental context, an “ecology of attention”. Participants are invited to reflect on sonic concepts using sound, video, installation, performance, meditation, writing and drawing on site in Kefalonia Island in Greece. Daily activities include collective on-site experiments: action-performance, field recording, video art, drawing, writing, readings and group discussions. The instructor will provide technical support in video and sound. At the end of this intensive creative and productive week, participants are encouraged to exhibit, perform or lecture their work in the main gallery of the Ionion Centre for the Arts and Culture in Kefalonia. Jacob Kirkegaard has gallery representation through Galleri Tom Christoffersen (DK) and Fridman Gallery (USA). His work is represented in the permanent collection of LOUISIANA - Museum of Modern Art in Denmark. KIrkegaard's sound works are released on the TOUCH (UK), Important Records (USA), mAtter (JAP), VON Archives (FR), Holotype Editions (GR) & Posh Isolation (DK) labels. He is a founding member of the sound art collective freq_out. In 2016 Jacob Kirkegaard was the sound-artist-in-residency at St. John's College, University of Oxford, U.K.
Meet and network with participating international artists. Participants are encouraged at the end of the field trip to exhibit, perform or lecture their production in the main gallery at the Ionion Centre for the Arts and Culture. Participants must bring their own equipment to produce their artwork during Resound Kefalonia. Limited audiovisual equipment will be available for the exhibition. Nagaras #2, Jacob Kirkegaard, 2008.